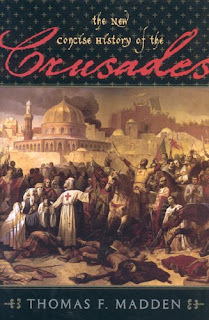 The Crusades are one the central and most important aspects of medieval history. But, as I have already pointed out here (and here), they are also one of the most mischaracterized aspects of the entire history of Western civilization. Often misunderstood by historians and, consequently, by media and public opinion, Crusades and Crusaders—even before September 11, when they became a topical subject—have been frequently misused for political and propaganda purposes. To make an example, in a 1998 manifesto, cosigned by the leaders of Islamist groups in Egypt, Pakistan, and Bangladesh, Osama bin Laden declared war against the “Jews and the Crusaders.” Of course, basically the Americans are the Crusaders here. For more information on the topic, see also The Crusades: When Christendom Pushed Back. Thomas F. Madden is associate professor and chair of the Department of History at Saint Louis University. He is the author of numerous works, including The New Concise History of the Crusades . One of my favorite subjects! I recommend Madden to everyone. Islamists apparently learned the lesson correctly; saw their first imperialist foray into Europe fail, and are now doing a soft invasion of Europe. No chance of retaliation from Europe this time either. They're filling the void left by the abandonment of Christianity. Their population is growing by leaps and bounds, and Europe's is quickly shrinking. Let's see, big population vs little population, fascist ideology vs no ideology except appeasement. Gee, wonder who'll win this round? Going to war as a penitential act of love and charity? War is never an act of love or charity. At best it is a necessary expedient to protect oneself from aggression, and it is never an ideal solution. It always costs innocent lives and it always diverts resources away from productive activities. When the aggression of one group of people against another cannot be deterred, as was the case with the Islamic hordes of the 11th century against the Christian nations, the British against the American colonists in the 18th century and the Nazis against their neighbors in the 20th century, it is sometimes necessary to go to war. That is neither love nor charity. It is choosing something bad in order to avoid the consequences of something even worse. Defending Europe against Muslim invaders was obligatory, but invading Muslim territories for religious motives, would of course be another argument. I would much prefer to go along with a glorified version of the 'truth' but unfortunately there are other fateful versions that we should also consider. In view of this allow me be the Devil's Advocate. The Second and Third Crusade were failures, the latter leading to Christian powers arguing over spoils of war and a treaty stating that Jerusalem would remain under Muslim control but allowing unarmed, Christian pilgrims the right to visit the city. This however was not satisfactory for the Christian powers and it led to the Fourth Crusade. The original intention was to conquer Jerusalem but instead of this the Western European Crusaders invaded Constantinople, which was then an Eastern Orthodox Christian city, and the capital of the Byzantine Empire. This caused the ultimate great division between the Eastern Orthodox Church and the Roman Catholic Church. The exact statement is that “They [The Crusaders] were keenly aware of their sinfulness and eager to undertake the hardships of the Crusade as a penitential act of charity and love.” Which is different from saying that war “is” a penitential act of love and charity. However, perspective or if you prefer, “diachronicity,” is necessary. We need to refer to phenomena (ie war) as they change through time. Thus, what was once conceived as a penitential act of charity and love, now appears as something quite differently. Were the Crusades really a failure? Sure, there was no Charles Martel and Battle of Tours, no Duke of Wellington at Waterloo; there was no history-changing engagement where we could say, ah, that is where we slew the dragon or “this was their finest hour.” And they accomplished none of their stated goals. But the Crusades era might have constituted a “holding action,” a time when Christendom was pushed toward the abyss and, outweighed and wobbling, pushed back. Of course, this isn’t the fashionable view. But it is easy today to characterize those medieval warriors any way we wish; they are no longer around to defend themselves. But had they not defended the West, we might not be troubling over the past at all — because we might not have a present. The ‘Devil’s Advocate’ reference was meant to soften the blow of offering historic facts that might not contribute positively towards defending an historic account. As we are generally on the same wave length it’s not a role that interests me or appeals to me as a rule, and less so as an invited contributor. the responsibility of a contributor who feels that he or she should offer another, valid opinion on a particular, historical subject that now seems to be regaining in importance and significance. At one time history could depend on the nationality, the political and religious tendencies, and maybe the particular frame of mind of the historian when the facts were related. The English version of the Boer War doesn’t exactly correspond with the Dutch version, for example. But today the international wealth of information is such that it’s less easy to successfully create historic reinterpretations to correspond with what one personally wishes to convey. This shouldn’t be taken as any sweeping judgement on Thomas Madden’s book. I haven’t had the pleasure of reading it therefore I’m not qualified to judge. I certainly go along with his observation on the Medieval defence of Europe, of European values and religion. But the important repercussions created by the Fourth Crusade are such that if it were not properly referred to, wouldn’t this be incorrect and incomplete even in A New Concise History of the Crusades? Often in history there are incidents, causes, interests and circumstances that interweave themselves into provoking a positive or a negative effect. This was certainly the case regarding the Sac of Constantinople. Because of this, it’s an interesting subject, and although it might now be considered an inopportune reminder- the least said about the better, the opposite could well be the case. For an article on it might also be timely proof that Europeans are not afraid of re-airing and readmitting the Medieval errors of their forefathers, because, needless to say, there is no question in their minds that such shameful history will ever be repeated.